Finished size 2 x 3 1/2"
From the product line that introduced the "Hello, my name is" badge, C-Line is proud to present the small name tent cards. The 2 x 3 1/2" folded name tent cards are design for simple and easy to fold system, with the capability to stand visible on desk, table, or any flat surface. It is the perfect addition for office tables, large conferences or just a meeting. Also available sold separately, the reusable heavyweight plastic tent holder. The holder is heavy-duty created to give a long lasting protection for the name tent which will cut down the number of reprinting. For your next conference, impress your guests with the C-Line premium name tent cards. Transcript: Welcome to MyBinding.com. These are the 2 x 3 1/2" Rigid Heavyweight Plastic Name Tent Holders from C-Line. From the company that brought us the classic “Hello, my name is” badge, C-Line is proud to present these small name card tents. For conferences, trade shows, or large meetings, prominent name cards and branding are very important. These durable, transparent name card holders are 2x3.5” and are perfect size for business cards, or name cards to be printed out. They stand up strong and clearly display the document inside. Pick up a pack and make everyone’s name prominent. Welcome to MyBinding.com. 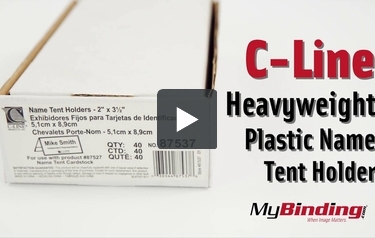 These are the 2 x 3 1/2" Rigid Heavyweight Plastic Name Tent Holders from C-Line.